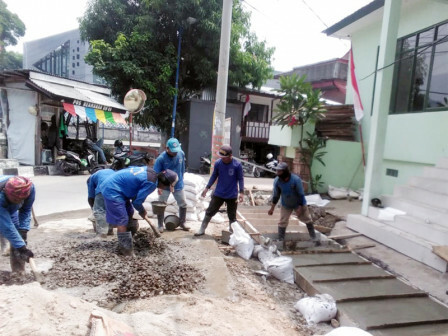 Senen Sub-district SDA Unit normalizes connecting (PHB) channel on Jalan Inspeksi Kali Ciliwung, RW 09, Kenari Urban Village. Besides repairing retaining wall, this unit will also dredge and install channel's cover.
" We will repair the collapsed retaining wall and install its cover"
"This channel has 80 meters long, 80 centimeters width, and 150 centimeters depth. We will repair the collapsed retaining wall and install its cover," said M. Rochman, Head of Senen Sub-district SDA Units, Monday (9/3). Meanwhile, Kenari Urban Village Head, Triana Eka informed, this channel hasn't been repaired for a long time. It is cracked at first and now collapsed. Her side is worried its condition will be worsened if it is not repaired immediately. "Hopefully this repair can be finished soon because we can't predict the weather. Heavy rain can fall any time like yesterday," she affirmed.